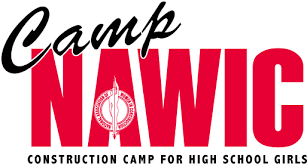 The Greater Kansas City Chapter of National Association of Women in Construction (NAWIC) is excited to host the 9th year of Camp NAWIC Summer Camp. This FREE week-long summer camp for high school girls is designed to offer real hands-on opportunities to learn the basics of safety, carpentry, electrical, painting, plumbing, concrete and welding. It also includes a field trip to a construction site. Each day of camp the girls will focus on several skilled trade areas and will be taught by certified instructors teaching with journey level woman in that specific trade. Campers will be challenged to learn skills they have never considered while having fun. The 2019’s Camp NAWIC is scheduled for the week of June 3rd - 7th. Your sponsorship of this camp allows us to offer high school ladies the opportunity of participating in the camp free of charge. On Friday, June 7th, we will host a catered lunch for the ladies, their parents, school administrators, and our sponsors. The lunch will include a completion ceremony as well as an opportunity to view campers’ projects. Our mission is to encourage young ladies to enter this exciting career path and to address the shortages of skilled workers prevalent as well as to continue to promote diversity in our construction workforce. The connections they make here are invaluable, and can help to lead them in this chosen field of interest. CAMP NAWIC is committed to providing a Tool Scholarship for any High School Senior who has attended the Camp and obtains a Letter of Intent after completing  hours in her chosen trade. We hope you will consider joining with the Greater Kansas City Chapter #100 of NAWIC in this positive effort to introduce girls to the world of construction by becoming a sponsor of our Construction Camp. Additional information on sponsorships is included on the next page. Thank you in advance for helping us to offer this unique and empowering program for high school girls. We look forward to working with you. If you have any questions concerning the Camp, please do not hesitate to contact Shannon Seipel by email at sseipel@buildersassociation.com .